As all good cooking stories (of late) do, this one starts on Pinterest. I saw a recipe, loved the idea, made it my own. As someone who can only have limited amounts (read – really should have none) of wheat and dairy I loved the idea of an alternative crust to quiche. So out with the wheat and in with the new! I made a non-healthy version and a healthy version of this, both within a weekend span. So you know it’s good. Aside from slicing and dicing, this really is an easy recipe too! The second version I made for an on-the-go breakfast. It takes 5-8 minutes to heat up in the toaster oven and can be done while I am packing lunch and feeding the dog before work! First the unhealthy (really just less healthy) one! Preheat oven to 425. 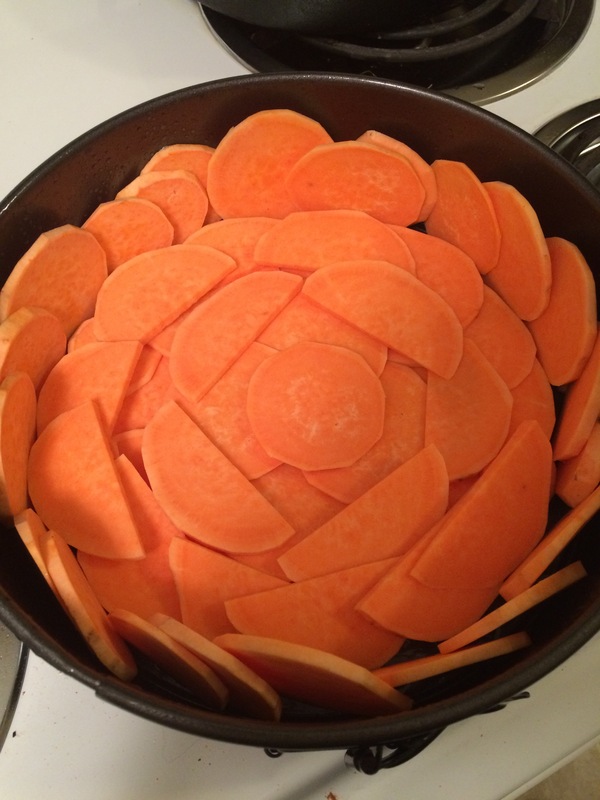 Layer the thinly sliced sweet potato in a spring form pan (for presentation wow) or in a deep pie tin till the sides and bottom are covered. It’s ok to have double layers in places and overlap on the edges. Bake for 15 minutes. When you remove, drop oven temperature to 375. Meanwhile, heat butter or oil in medium sized pan and sauté onion till it is translucent. Add garlic, sauté another 2-3 minute. Add spinach and cook till it is completely wilted down. Drain excess liquid if necessary. Remove from heat. Wish together eggs and Daiya (or other cheese substitute), then add slightly cooled vegetables. Pour the egg mixture over the sweet potatoes. Bake at 375 for about 30 minutes or till it is golden brown and set. Best served warm. I typically let quiche cool about 20 minutes before serving. The healthier version is made exactly the same was as the Ham and Spinach Quiche except instead of sautéing the vegetables in oil, I use a more non-stick pan and a quick coat of Pam Coconut Oil spray. Each quiche will serve 3 as a main dish or 4 if served along side other items.